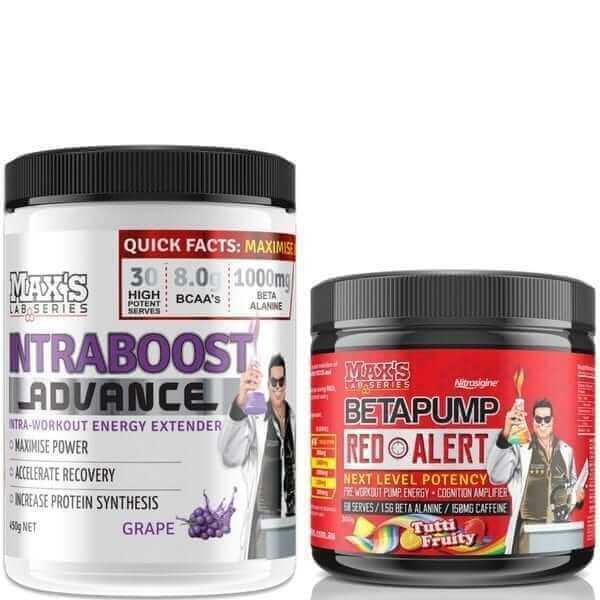 Maxs Lab Series BetaPump Intraboost Pack Contains the Powerful Pre Workout BetaPump along with the Delicious Intraboost to help power up your Workout. Energy & Endurance Extender Blend. Beta Alanine (3000mg) – is a precursor to Carnosine. In muscle, Carnosine buffers acidity from anaerobic contraction to allow your muscles to continue working harder, longer, and with strong force – which triggers maximum training response for accelerated gains. Creatine Monohydrate (1500mg) – is one of the best and most efficient ergogenic compounds you can use to boost power, energy, strength, endurance and protein synthesis! 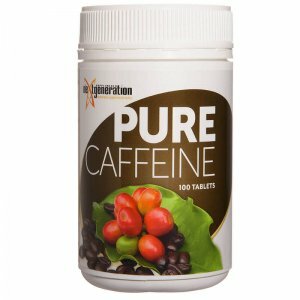 Caffeine Complex (300mg) – RED Alert contains a blend of Caffeine Anhydrous, the traditional form of caffeine, and InfinergyTM (di-caffeine malate). Infinergy offers a unique advantage in that the malic acid calms the digestive distress commonly caused by natural caffeine and caffeine anhydrous, meaning it’s more comfortable on the stomach. N Acetyl Tyrosine (100mg) – is the acetylated form of Tyrosine, meaning the amino acid is bonded to an acetyl group Free form tyrosine doesn’t dissolve quickly in water, so it’s not well absorbed. However, N-Acetyl L-Tyrosine is incredibly soluble. Interestingly enough, due to NALT’s improved water solubility, it’s often used for intravenous feedings (parenteral nutrition) instead of L-Tyrosine. NALT is converted in the body back into L-Tyrosine where it’s used to create several powerful neurotransmitters including epinephrine (adrenaline), norepinephrine (noradrenaline. Uridine Monophosphate (100mg) – has powerful beneficial effects on brain function. It is an essential precursor of cytidine diphosphate (CDP)-choline which plays a critical role in neuron metabolism. It also boosts feel-good hormones in the brain. Alpha GPC (Alpha-glycerophosphocholine 150mg) – is a cholinergic compound that is widely used for its cognitive-promoting properties. Huperzine A (100mcg) – is an acetylcholinesterase inhibitor, which means that it stops an enzyme from breaking down acetylcholine which results in increases in acetylcholine. Acetylcholine is known as the learning neurotransmitter and is involved in muscle contraction as well. Increasing levels of acetylcholine are routinely used as a technique amongst scholars for improving focus and cognition, and weight-lifters in enhancing both concentration and power. Citrulline Malate (3000mg) – Multiple studies show Citrulline Malate improves anaerobic power significantly (up to 15%). It works by increasing blood levels or Arginine and Ornithine, both powerful vasodilators and help GH Levels in the body. Red Alert has increased the levels of Citrulline Malate to maximise this effect. Agmatine Sulfate (50mg) – is a neurotransmitter and neuromodulator. For athletes it has the very beneficial effect of reducing the perception of pain and discomfort, allowing them to push past normal pain or discomfort thresholds to achieve better results. It is also a potent Vasodilator, helping to improve blood flow. Nitrosigine (Arginine Silicate 50mg) – is a patented complex of arginine and silicon that has proven to be a potent NO booster and vasodilator. It is up to 5 times more efficient than standard L-Arginine. – For Strong Stim, pump and focus – Mix one scoop of BetaPump in 200ml of cold water and consume 20 – 30 minutes before workout or sport. – For Mega Stim, skin tearing pumps and insane focus – Mix two scoops of BetaPump in 200ml of cold water and consume 20 – 30 minutes before workout or sport. All severe trainers are looking to take their workouts to the NEXT LEVEL! WARNING: DO NOT EXCEED 2 SCOOPS OF BETAPUMP RED ALERT A DAY. 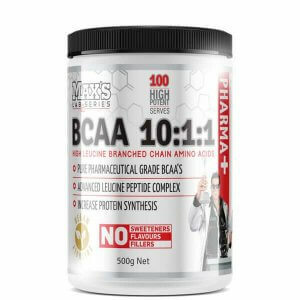 Micronised Branched Chain Amino Acid Complex 8000mg – are the essential amino acids Leucine, Isoleucine and Valine in a 2:1:1 ratio. BCAA’s, particularly Leucine, is oxidised to produce cellular energy during hard weight training. They spare carbohydrates to extend your energy reserves and also act as signalling compounds to activate your mTOR protein synthesis during and after training. Glutamine and Glutamine Peptides 2600mg – Glutamine is widely acknowledged as the “anti-catabolic” amino acid. 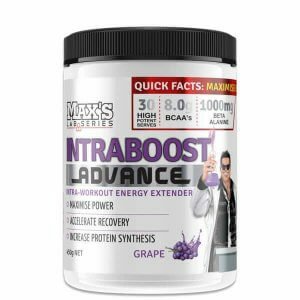 It protects your muscles from degradation commonly associated with heavy strength training which allows protein synthesis to start sooner to accelerate recovery. Electrolytes are salt ions found in the body that have the critical role of maintaining the balance of fluids between the intracellular and extracellular environments. Maintaining this balance is essential for the following processes; hydration, nerve impulses, muscle function and pH level. Potassium Citrate – found inside cells and forming half of the electrical pump that keeps electrolytes in balance, potassium allows conductivity between cells and is mainly crucial for regulating heartbeat and muscle function. Sodium Chloride – the other half of the electrical pump, sodium is found outside cells and is responsible for controlling the total amount of water in the body. In doing so, it helps regulate blood volume and maintains muscle and nerve function. Magnesium Sulphate – is essential in maintaining healthy nerve and muscle function, boosting the immune system as well as stable heart rate and blood sugar levels. Beta Alanine – 1500mg, Micronised Creatine Monohydrate – 750mg, InfinergyTM Caffeine Complex (caffeine anhydrous, di-caffeine malate) – 150mg. N Acetyl Tyrosine, Uridine Monophosphate, Alpha GPC (Alpha-glycerophosphocholine 50%), Huperzine A (Huperzia Serrata leaf standardized extract) 252.50mg. Citrulline Malate 2:1, Agmatine Sulfate, Nitrosigine® (Arginine Silicate) -1550mg. Silicon Dioxide, Malic Acid, Natural Flavours, Flavours, Citric Acid, Sweeteners (Stevia, Sucralose), Colours.